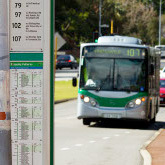 Transperth – Journey Planner, SmartRider and timetable information. Campus map – includes search function for specific buildings and nearest parking. Finding a parking space on or near UWA's Crawley Campus can be difficult. We recommended that you walk, cycle or use public transport to get to the University of Western Australia. If you must drive to UWA please obey the parking signs. Illegal parking will attract an infringement notice. Turn right at the intersection of Winthrop Avenue and Stirling Highway. You will immediately come to a T-junction. The University is in front of you. Turn left or right onto a road that runs along the campus perimeter. Enter the left lane shortly before you reach the Narrows Bridge (which spans the Swan River about one kilometre from the city business centre). About 500 metres after the bridge, turn left into the Mounts Bay Road exit. Keep in the left-hand lane. Turn left into Mounts Bay Road. You are now heading towards the Swan River. You will approach a roundabout. Turn right into Stirling Highway, which runs along the edge of the Swan River. Keep in the left-hand lane. Once Stirling Highway leaves the edge of the river, take the first turn left. You are in Hackett Drive. Turn first or second right to access a road that runs along the campus perimeter. Select the Mounts Bay Road exit. Follow it to the traffic lights at Mounts Bay Road and turn left. You will be heading towards the Swan River. Within one kilometre you will approach a roundabout near the river. Turn right onto the roundabout; you will still be on Mounts Bay Road, which runs along the edge of the Swan River. Once Mounts Bay Road leaves the edge of the river, take the first turn left. You are in Hackett Drive. Turn first or second right to access a road that runs inside the campus perimeter.